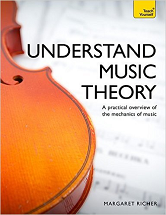 Understand Music Theory offers a practical approach which uses active learning to impart knowledge. Suitable for complete beginners, and assuming no previous knowledge, each chapter includes examples, illustrations, clear explanations, tips and self-tests before moving on. It covers all the essential topics in music theory, from rhythm and pitch to intervals, major and minor scales and compound time signatures. It also goes beyond these basic concepts to more advanced theory such as harmony, tone colour and musical form, to provide a genuinely comprehensive introduction to music theory.